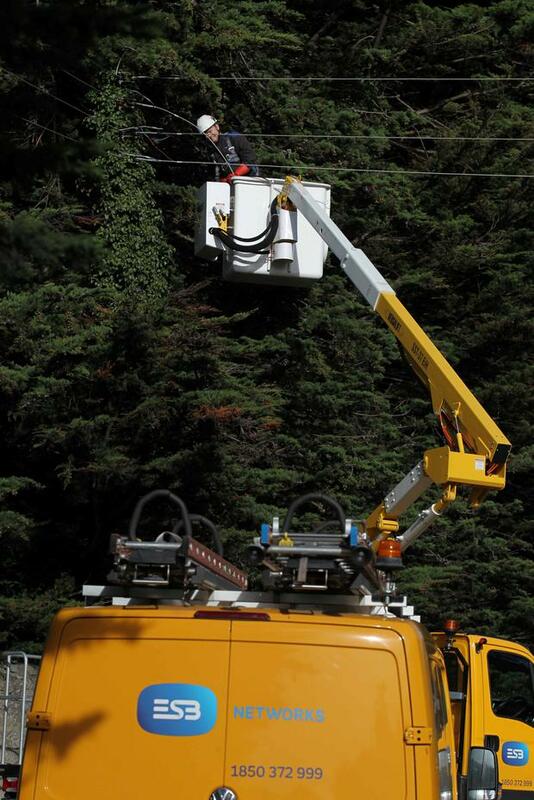 Heavy rain and high winds forecast today and over the weekend will hamper efforts to restore power, water and internet services to thousands of households across the State. Gusts of up to 110kmh could strike the country by the weekend, but the National Emergency Co-ordination Group (NECG) has insisted it will not be anything exceptional. "We don't have any serious concerns," NECG chairman Sean Hogan said. And Met Éireann has insisted that there is no 'Storm Brian' en route to Ireland. Forecaster Liz Walsh said experts were tracking a deep depression travelling across the Atlantic and not until tonight or tomorrow morning would it decide whether or not to classify it as a storm. Computer models suggested it would be wet and windy by the weekend, and the office has issued a status yellow advisory for today and the weekend. An Atlantic depression is expected to track eastwards over parts of Ireland on Saturday, with potential for average wind speeds of 50kmh to 60kmh, and gusts of between 90kmh and 110kmh, especially on coastal counties which were badly hit by Ophelia. The warning is in place from 6pm tomorrow, to midnight on Saturday. Met Éireann has also issued a yellow rainfall warming for Munster, Dublin, Carlow, Kildare, Kilkenny, Louth, Wexford, Wicklow and Meath for today, with up to 50mm of rain expected on higher ground. "At this stage, it's a deep depression travelling across the Atlantic," Ms Walsh said. "We're not convinced we'll see anything other than a yellow level warning. That means it won't be a named storm, but that's not to say that consecutive runs of the model won't change that. "At present, this system is coming in on Friday night and Saturday morning. At this stage, we're using the latest forecast data we have and expect a yellow level wind warming." The UK Met Office and Met Éireann names storms to raise public awareness - the first was Aileen, and struck in September. The next will be Brian. The US names hurricanes which originate from the east, and Ophelia was the 15th this season.